I would love it if you came to visit me at my workplace and asked me to recommend a book. I work in a library and I really enjoy books, so as you can imagine, I enjoy my job immensely. One of my responsibilities is the children’s room. Our library is small, but we have a wonderful collection of children’s books and a fabulous reading chair for parents. So come on in and let me introduce you to one of our favorites. This book helps to introduce children to some of those wonderful pieces of music through great works of Art. It is brilliantly done. Thirteen pictures set the scene for each piece of music. You are asked to gaze at a wide variety of beautiful and interesting artwork, while playing the accompanying tracks on the enclosed CD. On each page are guided questions that help readers make connections between the sounds of the instruments and the mental images they can convey. 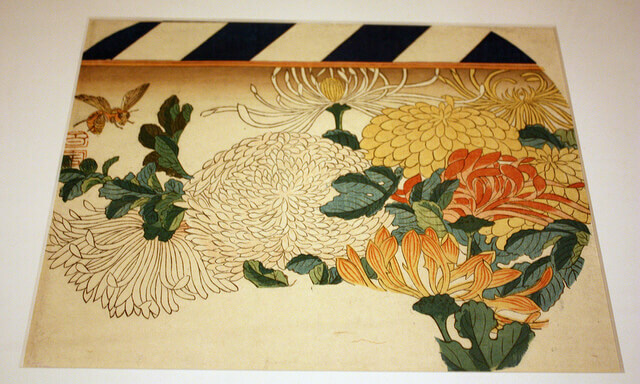 For Example Chrysanthemums a Japanese print of a bee hovering over some flowers (pictured above) is paired with Rimsky-Korsakov’s The Flight of the Bumblebee. Can You Hear It? 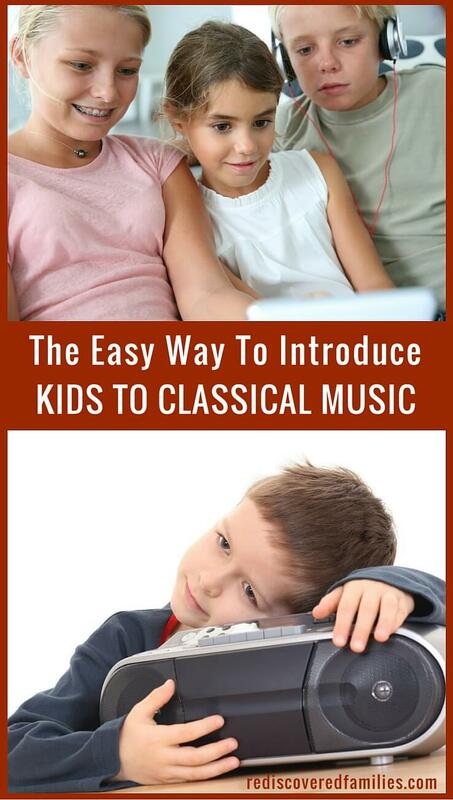 opens with “An Introduction to Musical Instruments” section, which is informative and interesting, although you may want to skip it with younger children. At the back is a brief section with notes on the artists, composers, and the works. This book is really popular at our library and doesn’t stay on the shelf for long. It is a feast for the senses and introduces children to wonderful pieces of art and music. It is simple enough to use that you do not need to know anything about music or art. In fact you may learn something yourself. This is a book to savor and enjoy with your children. Older children might breeze through all thirteen pieces independently, but I think this is something for parents and children to share together. It is not something to be rushed, take your time to enjoy the artwork and the music. Perhaps you might invite your children to join you and look at one or two masterpieces at a time. What words come to mind when you see this picture? What would you like to ask the artist about this painting? If you could jump into this picture where would you go? What pictures does the music paint in your head? How does this piece of music go with this painting? Then read the information and ask the questions posed on the page. Afterward if you have time you might replay the track and invite children to move to the music or create their own artwork to go with it. This is definitely one of the books I would recommend if you came into our library looking for something to read with your children. It’s not a traditional story, more of an I Spy Book with a twist. But it is a wonderful book to enjoy together. I would recommend checking Can You Hear It out of your local library, however if you wish to purchase it you can find it here . I’m always on the look out for new children’s books. What are you reading with your kids? This looks so beautiful! The library was an important place for me as a child. I was fixated on reading rather than listening. I wonder how my world would have opened up if I had the pleasure of a book/CD like this one! I’m so happy for all the kids and adult that get to enjoy it. Sandra Pawula recently posted…Sad? Amplify Joy! It was the same for me Sandra. I wish there were books like this available when I was growing up. Still I get to enjoy them now, which is one of the best parts about working in a library. We love books and music and can’t wait to get this at our library! I really hope they have it and if not, I’ll ask them to get it! Francesca recently posted…Winter, be gone! That sounds wonderful, I wonder if I’ll be able to find it in the UK. Thanks for linking up to our Parenting Pin-it Party. I had a quick look at Amazon UK and they have it, but who knows maybe your library will have it on their shelves. This book looks amazing. 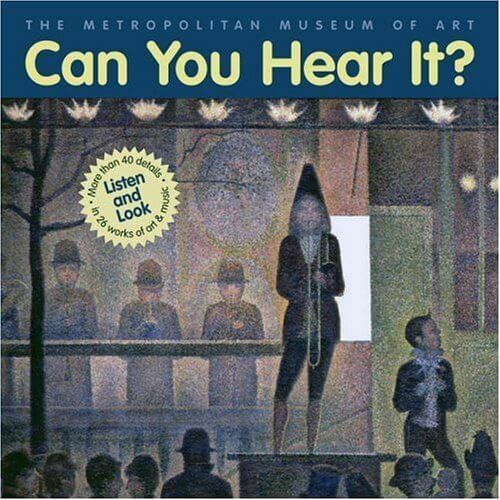 I love books that teach about the arts and your open ended questions are perfect. Visiting from the After School Link Up. Thanks for posting. Now following you via twitter. Have a great week! It seems like a wonderful book. I would love it, let alone the kids 😉 Thanks for sharing it. I must admit I love the book as much as the children do! Danya Banya recently posted…There’s a ball pit in our loungeroom! wonderful! I hope you find it at your library. Oh, I just saw this book on Amazon today. I want to get it for our Classical Music week that is coming up! Thanks for sharing with Afterschool! I love the list of open ended questions you suggested. Thanks so much for linking up with After School! after reading your post in summer I always was thinking of this book ;-). Unfortunately our library doesn’t have many English books, but when I placed an order with The Book Depository, I added it. And I love it! The music and pictures go so well together! My daughter was also very interested and sat still for about 10 minutes, which is a record ;-). Thanks a lot for this recommendation! I am so glad that you found the book and your daughter enjoyed it. I wish the author would make another such book. It’s such a neat idea! I just wanted to let you know that after not having a look at this book for about 3 months, my daughter and I sat down yesterday and enjoyed it again so much! She explained to her doll, who had to join, that she needs to listen carefully and was – again – fascinated by the pics. It’s a great book to come back to, as every time one will find/notice something new in the pictures or the music. Thank you for letting me know Daniela. You just made my day! I’m so glad you are enjoying this book with your daughter. It is a wonderful one to share.